During your slow business periods, you can use Promotions to attract new and existing clients to generate more business. In this example, we will set up a promotion for 50% Off All Hair services for the month of October. It is a single code promotion that your clients can use to receive the promotion. This can be done via Online Booking or in the during the Sales payment process. In the Details for new Promotion screen, simply follow the steps illustrated below. You must enter a Promotion Title, Start Date, Discount Type and Discount Amount. Make sure to also enter an End Date for the promotion. 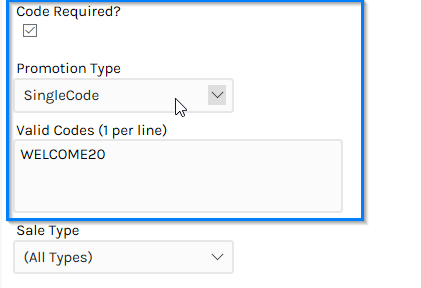 To enable the single-code promotion tick the Code Required? checkbox, select SingleCode in the Promotion Type field and enter the code in the Valid Codes field. In the Promotion Availability section, tick which Days of the week the promotion will be available. Also select how often the promotion will be available. For example if it is available all the time with in the given Start and End Date tick all the Days and Repeat every 1 Week. If it is available every second week (such as Pensioner specials) then Repeat every 2 Weeks. The Promotion Search screen will appear stating that the Promotion has been saved. Then click on the promotion record. In the Promotion Details screen under the Apply to the following Items section, click the Click here to send an SMS message... link to let your clients know about the promotion.